A previously well 50 year old presents with sharp severe chest pain after a long haul flight from North America. A chest X-ray and ECG are performed and reveal no abnormalities. The examination is unremarkable. 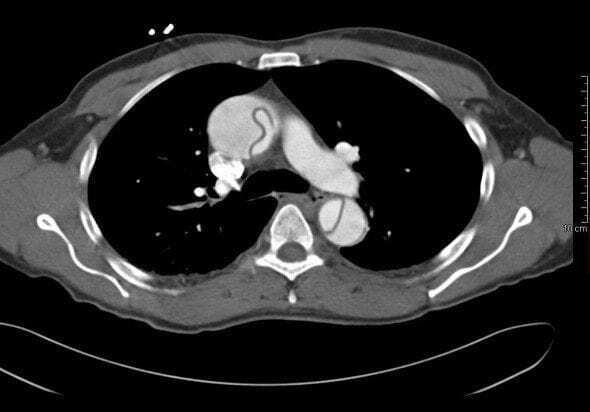 The patient proceeds to a CTA chest. There are two systems in common usage. Type A dissections are usually managed surgically with aortic root replacement. Type B dissections are usually managed with endoluminal approaches and medical management. While awaiting definitive intervention, blood pressure control is the most critical intervention. Blood pressure should be controlled as rapidly as possible aiming for a systolic blood pressure of 120mmHg or even less using a combination of IV beta blocker (reduces heart rate and shearing forces on the aorta), then GTN +/- sodium nitroprusside (decreases afterload). Where it is available IV labetalol is a good choice. At the age of 97, Michael DeBakey suffered an aortic dissection. He declined surgery (the procedure that he had developed); however, after he lapsed into unconsciousness, the surgery was performed anyway with the approval of the local hospital ethics committee. He was hospitalised for 8 months after his operation and eventually recovered and was able to return to work. He subsequently thanked the surgical team for prolonging his life and worked until the day he died at the age of 99.